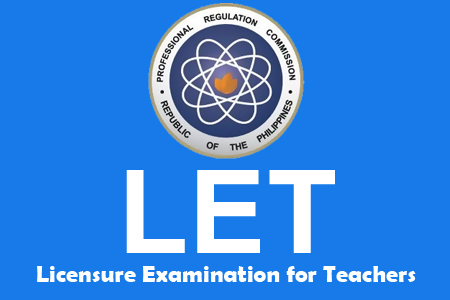 The Professional Regulation Commission (PRC) announced that there will be a total of 76,230 examinees who will take Licensure Examination for Teachers (LET) this month of March 2013. The PRC said, "LET takers comes from the National Capital Region with an estimated 16,815 examinees while 0.72% or 547 examinees will take the exam in Hong Kong." All examinees must be at the designated examination site/center before 7:00AM and to bring their notices of admission, two or more pencils (No.2), ballpens with BLACK INK, one piece metered-stamp window envelope, one piece long brown envelope, and one piece long transparent (non-colored) plastic envelope on examination day, PRC advised. All testing center in the following areas such as Manila, Cagayan De Oro, Cebu, Davao, Iloilo, Legazpi, Lucena, Pagadian, Tacloban, Catarman-Samar, Tuguegarao, Zamboanga, and Hong Kong, are ready to accommodate all examinees. For PRC rules and regulation inside the testing centers are can be found here. For the meantime, if you like the information about March 2013 LET, please bookmark this page and share it to your friends on Facebook, Twitter and Google+. Comments or suggestions about "PRC: 76,230 Examinees of March 2013 LET" is important to us, you may share it by using the comment box below.